She looked elegant in this ethnic wear alon with a antique silver necklace around her neck by Deepika Jeweelers. She was attending Daredia Constructions event in Hyderabad. 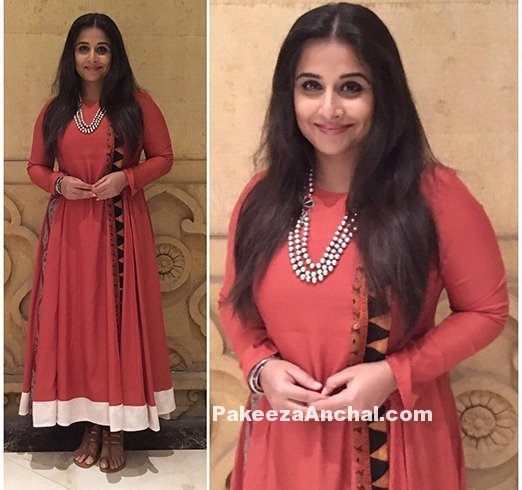 Vidya Balan was all set in a Orange Salwar Suit designed by Natasha J Couture. She wore a pearl necklace from Amrapali Jewelry and kept her hair open with minimal make-up. She wore this outfit during the screening of Aamir Khan’s movie Dangal. Priyanka Chopra has been featured in many fashion magazine in trendy stylish Salwar Kameez and in varied patterns. She was also a face of Saheli Couture and other brands in India. She was styled in unique design Salwar Kameez, Anarkali Salwar Kameez in the photoshoots. You can see your lovely Priyanka Chopra in trendy and ethnic Wear Salwar Kameez. Now a days Mastani Dress, Anarkali and Double Ghera dresses are in fashion. We will also be posting any of the latest designs Priyanka Chopra wore in recent events soon. Saheli Couture is one of the best branded Online store for modern and young girls with a fusion of ethnic desi attires with a pinch of Western looks. Katrina Kaif was seen glowing in Yellow Embroidered Long Anarkali Dress at IMC and UN Women Event ‘WeUnite’. Yellow Colored Long Frock Anarkali chudidar dress with pink border was designed by Abu Jani Sandeep Khosla. She completed her looks by simple earrings, pink lips and kept her long hair open. Actress Kajal Agarwal in Churidar Salwar kameez with embroidered yoke with neck neck pattern and short sleeved shirt paired with tight Churidar salwar and matching dupatta. Kajal Agarwal in self design Churidar Salwar kameez with ruffled sleeves and matching dupatta. Kajal Agarwal in Tight Churidar Dresses in from various movies. Latest Chudidaar Salwars for ethnic or home wear. 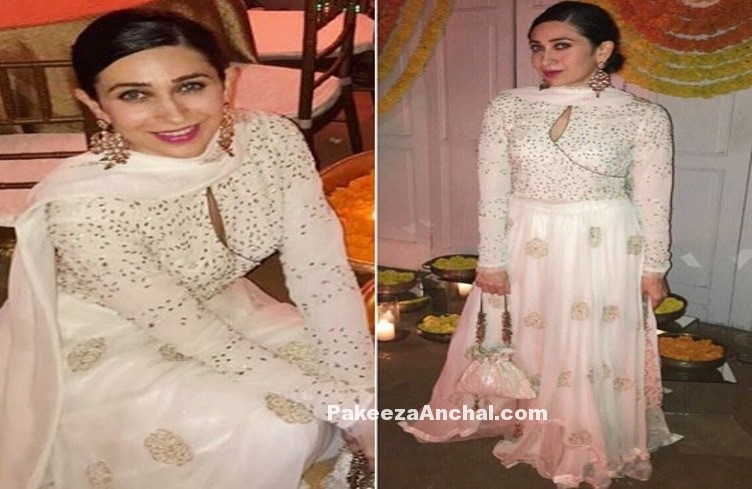 Karishma Kapoor was all dressed up for Diwali festival in a Ivory colored Floor length dress from the House of Kotwara by designer Meera Muzzaffar Ali. The outfit had a sequined bodice followed by ruffled layers. She also carried along jadau earrings and a white potli with her and her bun hairstyle was a compliment for the diwali festival. Sridevi was spotted in Manish Malhotra’s floor Length Dress with cut-outs on shoulder. Floor Length fitted Kurta had high slits till waist with peach thread work across the dress. She was seen at the premiere of the musical play ‘Mughal-E-Azam’. 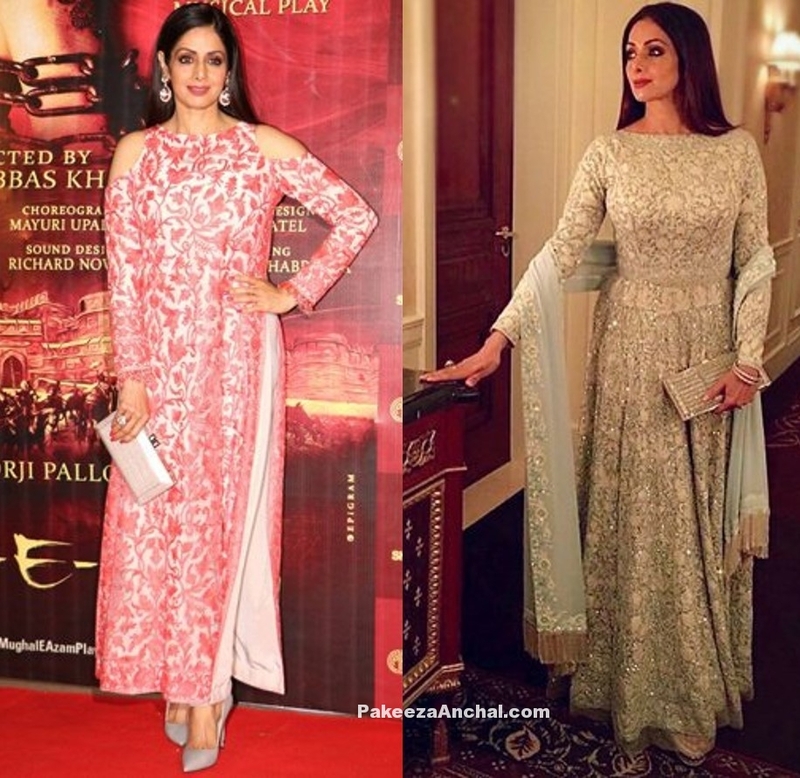 In another event, Sridevi was spotted in a heavily embellished floor Length dress designed by Sabyasachi. Sridevi was always known for her modern fashion and dressing since the time she started working in movies. Dia Mirza chose to wear ethnic mustard colored floor Length Anarkali dress in a recent Income Tax event. she stole the heart of everyone by wearing this sleeveless Floor Length Anarkali by Anita Dongre. With a Gajra and Anita Dongre’s Pink City jewelery collection she looked stunning during the event. Kajol was spotted in a white floor Length outfit with Golden embellishments (embroidery and chamki work) in floral design all over the dress during The Kapil Sharma show. The outfit was a full sleeved with stylish neck design by Bhumika Sharma. Kajol Devgan was present along with hubby Ajay Devgan for the promotion of his upcoming movie Shivaay. She wore Saiyami Jewels and kept her hair loose with minimal make-up and dark brown pout. Aishwarya Rai was along with Anushka Sharma and Ranbir Kapoor at the show.